Dakshineswar Kali Temple - Dakshineswar Kali Temple. 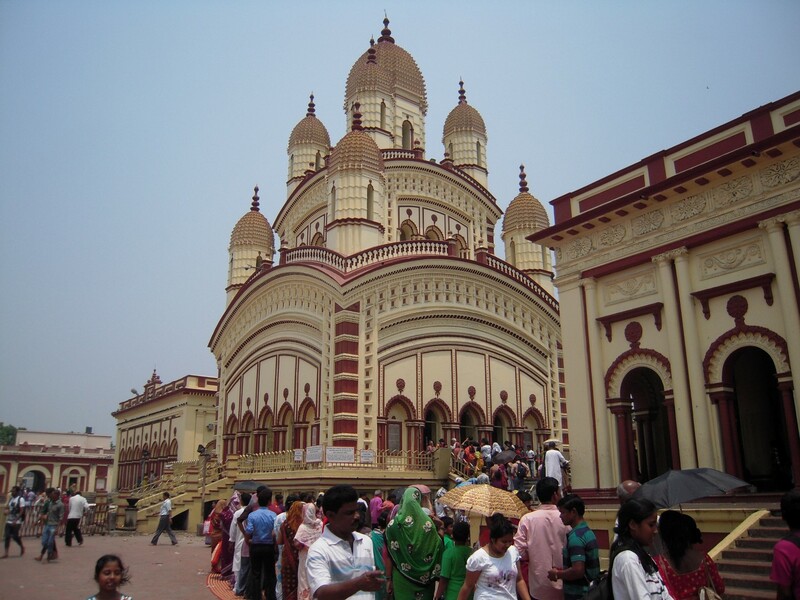 Photo by shankar s.
The Dakshineswar Kali temple is associated with an interesting storyline. The construction of this famous Kali temple started in 1847 and it ended in 1855. 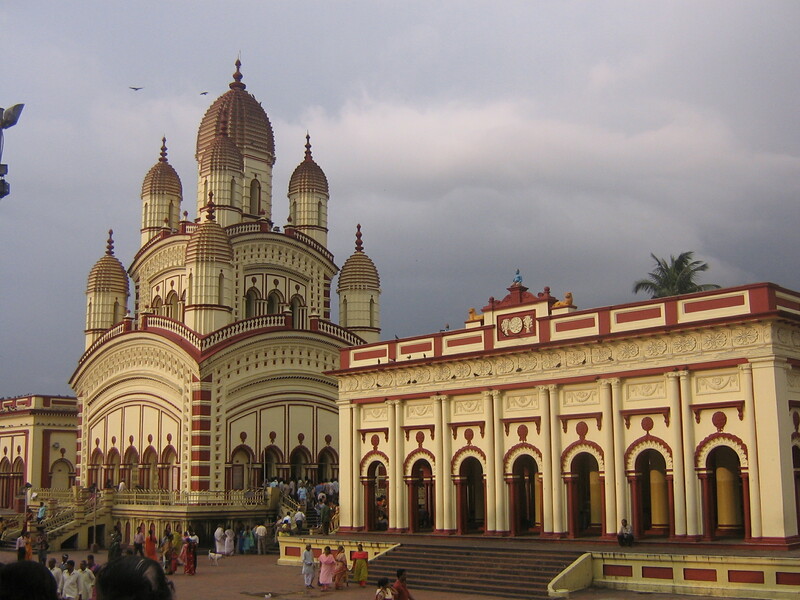 Dakshineswar Kali temple, which lies on the eastern banks of the Hoogly River, which also flows besides Kolkata, was built by the much-respected Queen Rashmoni of Janbazar . 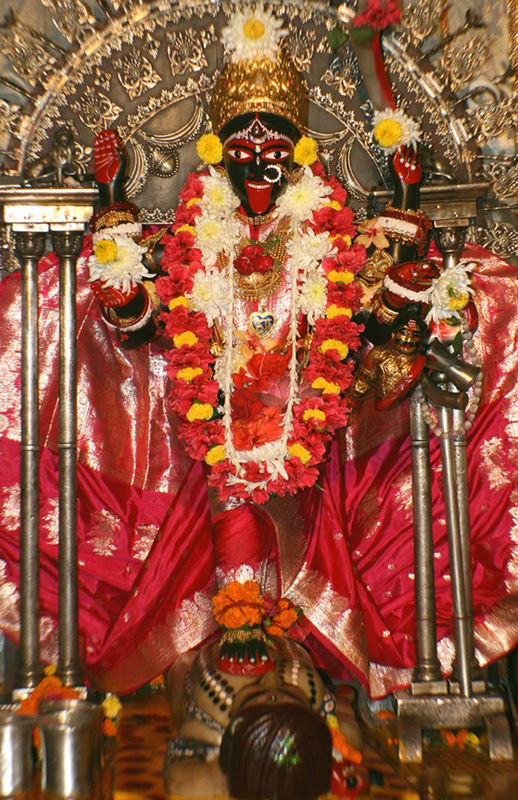 Dedicated to the Goddess Kali, the temple is located in the north of Belur Math, which is another religious edifice that was built in the honor of Sri Ramakrishna, the founder of Ramakrishna Mission , who was the priest of this temple for almost 30 years. 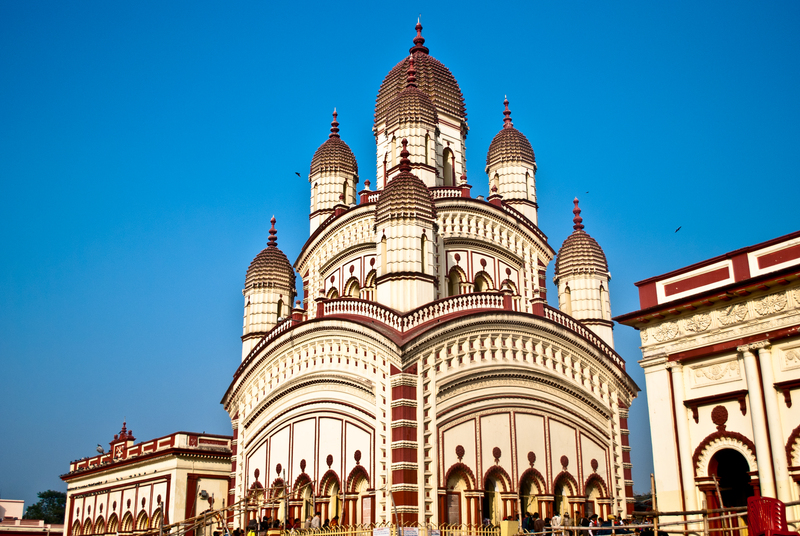 The Dakshineswar Temple is a spacious temple complex, which covers approximately 25 acres of land. 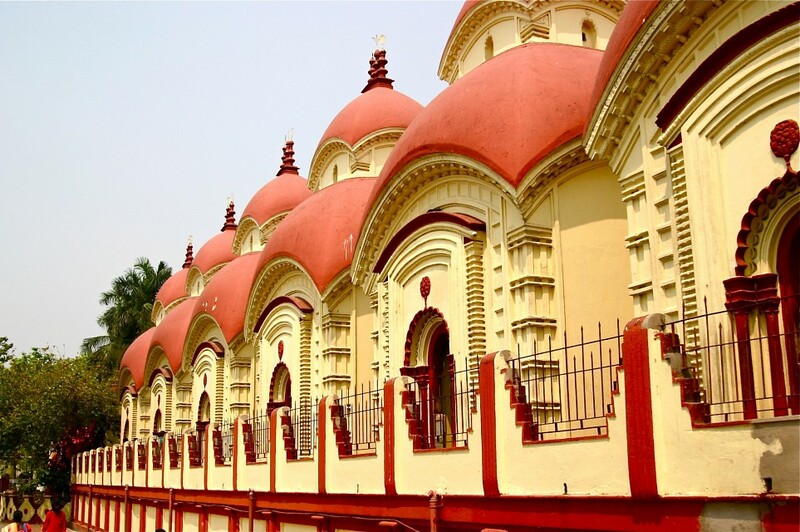 There is an interesting legend associated with the Dakshineswar Kali Temple. As the storyline goes, it has been heard, that when Queen Rashmoni was set to leave for the sacred city of Benaras by boat to visit the divine holy Mother Kali and seek her blessings, the Queen had a peculiar dream the night before her journey. It was said that the divine Mother Kali herself, appeared in the Queen’s dream and suggested to her to construct a beautiful temple on the banks of the Ganges (Hoogly) River, where the Goddess will manifest her divine spirituality. 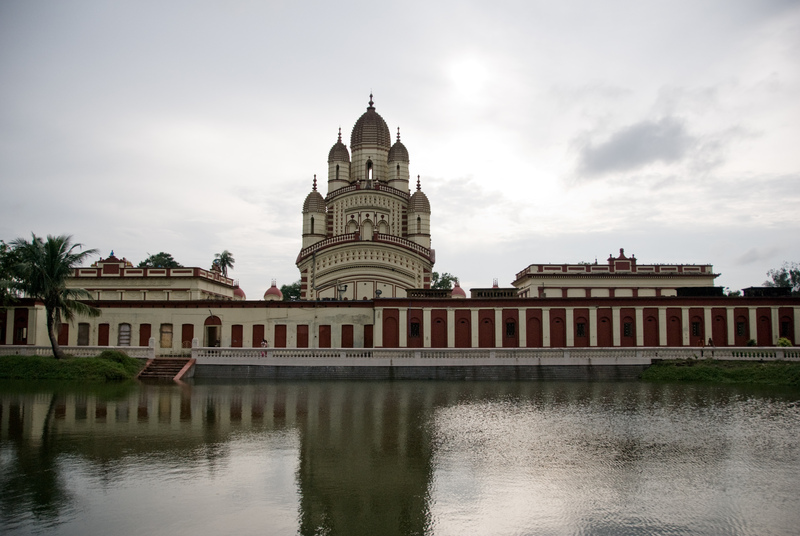 Dakshineswar is one of the largest temple complexes in and around Kolkata. 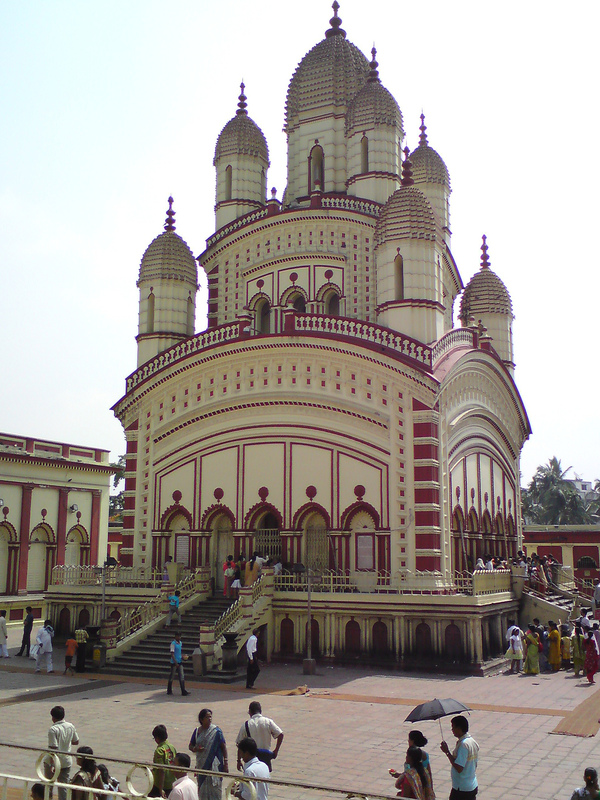 Dakshineswar Kali Temple. Photo by shankar s.
Apart from the nine-spired main Bhavataraini (another name of Kali) Temple, the courtyard in Dakshineswar Temple is surrounded by small temples and rooms all around the courtyard square. Among these, there are 12 shrines dedicated to Lord Shiva (who is Mother Kali’s eternal companion) which lies all along the Hoogly river front. Apart from that, there is the Radha-Krishna Temple , a shrine dedicated to Queen Rani Rashmoni and also a bathing-ghat which lies adjacent to the temple. Another notable place within Dakshineswar Kali temple complex is the “Nahavat-Khana’ which is a small room that lies in the northwestern corner beyond the last Shiva temple on this courtyard. 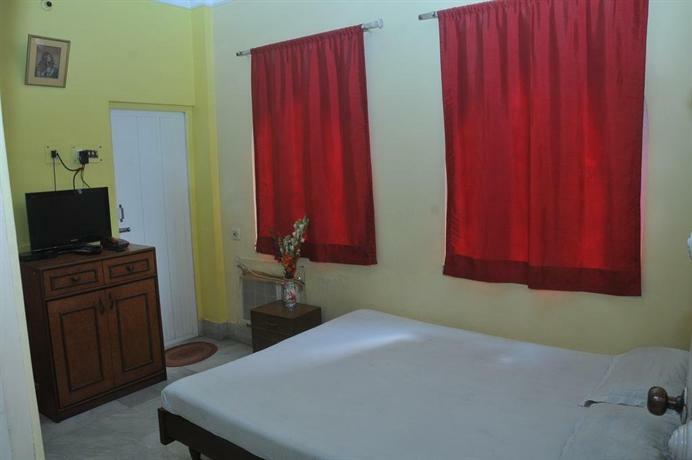 This is the room where the mystic Guru Sri Ramakrishna spent a considerable part of his life along with his wife Sarada Devi and also his followers, notably Swami Vivekananda . 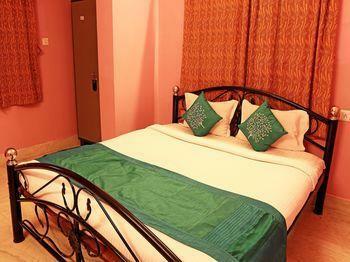 The sight of the Ganges River bank along with its cool breeze is also another place to visit while visiting Dakshineswar. One can take a spectacular and a refreshing boat ride from the temple to Belur Math, which may remain available throughout the day, except during the monsoons. Built in the traditional Bengali “Nava-ratna” or nine spired architectural style, the three-story temple complex has these spires on the upper two storeys of this building. The sanctum sanctorum, which houses the black idol of Goddess Kali who is also popularly known as ‘Bhavataraini’, is found standing on the chest of Lord Shiva, garlanded with hibiscus rosa-sinensis (Jaba) flowers and gold and silver jewelries. The twelve identical Shiva temples, which lies beside the Ganges River inside the temple’s courtyard, is typical of Bengal’s “Aat Chala” architectural style. Goddess Bhavataraini - Dakshineswar Kali Temple. 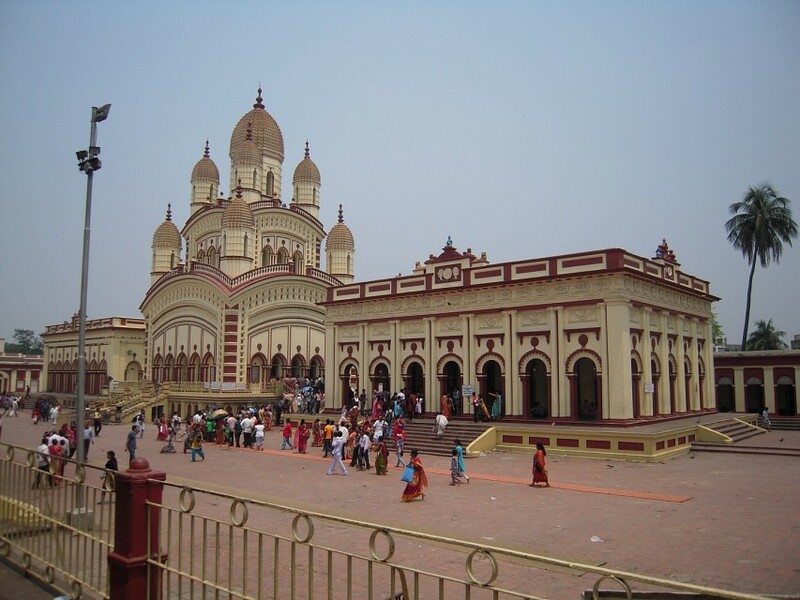 One can take a car from Kolkata city and visit the temple which hardly takes no more than an hour to visit this holy abode. 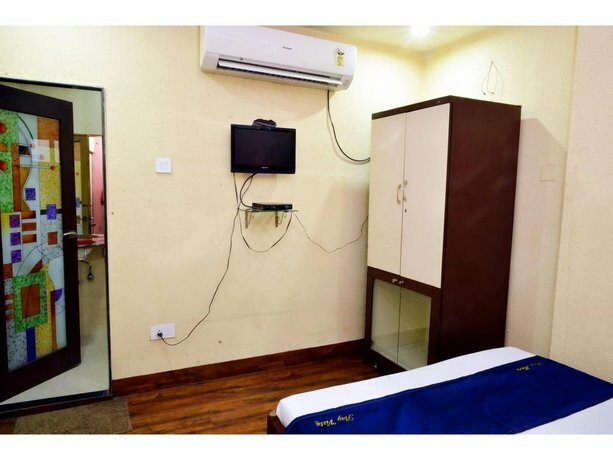 One can also take local trains from Sealdah station in Kolkata and alight at the Dakshineswar rail station, which is a simple 20 minutes ride. To mix with the Bengali city crowd, one can avail the local buses that plies between Kolkata and Dakshineswar throughout the day until late at night. 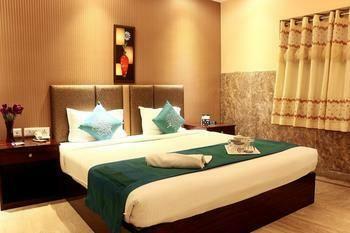 Kolkata- the capital city of West Bengal is connected with the rest of India and also with all major foreign destinations by air, train and interstate bus services which are all available for visiting this city. The temple remains open from 5 am in the morning till 1 pm in the afternoon and then again from 4 pm till 8 pm during the evening. One must avoid visiting the temple on Tuesdays and Saturdays as there is tremendous rush in the temple on these days of the week. Nevertheless to avoid the crowd one can visit this temple in the morning hours between 7 am and 8 am even on these auspicious days , to enjoy the serenity of this place. The evening prayer (Sandhya Arati) in the Dakshineshwar Temple is amazing, and so must not be missed by the tourists who wish to visit this place during the evening hours. Kali Puja is the main annual festival that is held during the month of October in this temple, and must be visited by the tourists- just in case they land up in and around Kolkata during that time of the year. 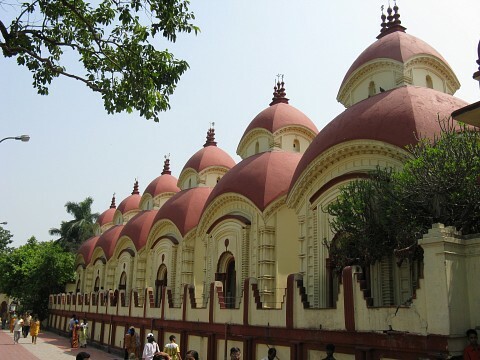 Although there are several private guest houses located around the temple, it is always preferable that travelers should consider staying in Kolkata for visiting this temple complex, which is just a day’s trip from the city. The local people of Dakshineswar understands Bengali, Hindi and also English so communication is never a problem with the localities staying in this area. Once one visits the Dakshineswar Temple, one can also visit Belur Math, and the Dakshineswar Ramkrishna Sangha- Adyapeath Temple which was built by Sri Annada Thakur in 1921.